Owning a dog builds character in children. They learn responsibility by taking care of an animal and keeping a schedule. 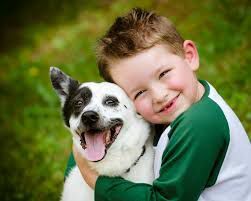 Kids with dogs may also be more physically fit from playing with their energetic friend and taking them on walks. The benefits of having a pet goes even further, as research finds more evidence to support that pet companionship greatly supports a child’s mental health. When children play with a dog, the interaction lowers the stress hormone cortisol and increases oxytocin — the bonding hormone. It is believed this plays a key role in the many mental health benefits of pet ownership. A study published in the journal Preventing Chronic Disease looked at the connections between having a dog and anxiety in children ages 4 to 10. Researchers found only 12 percent of children with a dog at home tested positive for anxiety. The American Psychological Association also found that owning a pet helped a person better handle negative emotions. The unconditional love and complete lack of judgement dogs offer creates a sense of security in children. Feelings of being important in the eyes of their beloved pet can help children develop a higher feeling of self-confidence. Children with pets are also less likely to suffer from separation anxiety — having an animal companion at home may help them cope with feelings of loneliness when their parents aren’t around. Most studies focus on dogs, but researchers agree these findings would also be applicable to cats. The benefits of pet ownership don’t disappear when a person grows up. The stress levels in adults who own dogs are also reported to be lower than those without a dog. Having a dog can help a person better deal with social rejections and physical ailments. Members of the American Heart Association agree that owning a dog can help reduce the risk of heart disease. Do you need more reasons to adopt a new best friend today?